Our December Leading Lady, Shona Chambers, is back for her triumphant third performance! If you missed her smashing debut you must see it CLICK HERE or her sensational second performance focusing upon beautiful backgrounds CLICK HERE. Today Shona has added some shimmer and shine to her stunning holiday cards! I'm back!! Yes its me again with my 3rd post as the Winnie and Walter - December Leading Lady!! For this post I wanted to concentrate on 'Metallic' designs. I LOVE using gold, rose gold and silver on my cards at any time of the year but it just seems to go with Christmas so perfectly. For this first card, I actually came up with the design while decorating the Christmas tree with baubles. I thought it would be great to have one hanging in a card and it could be used on their tree. I started off by die-cutting the hole in the card front using Essentials: Carly Cutaways. On a piece of white card stock I heat embossed the Mini Scenery: Merry Berry and the leaves from Framed with Evelin T. Designs with Ranger 'Queens Gold' embossing powder. I like this because its more of a rose gold than yellow gold. Over the embossed images I used a blending tool and Distress Ink 'Picked Raspberry'. I die-cut the leaves with their matching 'Cutaways' and the gold berries with the tag die from Essentials: Carly Cutaways. I used a hole punch above the large circle and tied on the tag with gold twine. The leaves were glued on and I heat embossed the sentiment from Merry and Bright with Evelin T. Designs on the inside of the card. For my second card I wanted rainbow colours with gold. I heat embossed the tree from Season's Tweetings with Evelin T. Designs 5x on white card stock. I then blended Distress Inks 'Picked Raspberry', 'Mustard Seed', 'Cracked Pistachio', 'Spiced Marmalade' and 'Salty Ocean' over each one. I used the matching Cutaway to cut them out. I then cut a strip of white card stock and put it on foam tape on the card front. The tree's were adhered in place so some of them hung over the edge. The sentiment from the same stamp set was simply stamped in black ink and I added some co-ordinating sequins from Pretty Pink Posh. Nothing like a rainbow Christmas!! For this design I decided to use my Nuvo Mousse 'Mother of Pearl' with the Scenery: Harleen Creative Screening on some white card stock. Once it had dried I used one of the circle dies from Essentials: Carly Cutaways. This was popped up using foam tape on the card front. The sentiment from Merry and Bright with Evelin T. Designs was heat embossed with Ranger 'Queens Gold' on a piece of vellum. I used the small tag die from Essentials: Carly Cutaways to cut it out and simply cut off the tag hole part to make it a circle. This was glued over the mousse along with some gold sequins from Pretty Pink Posh. This card is one of my favourites!! I stamped and heat embossed lots of small and large leaves (from Framed with Evelin T. Designs) in Ranger 'Queens Gold'. I gently blended Distress Ink 'Picked Raspberry' over them all and then used the matching Cutaways to cut them all out. I also cut a circle from white card stock using a die from Essentials: Carly Cutaways to serve as a base to the wreath. I glued down all the large leaves first and then tucked in the smaller ones. Once finished the circle was put on foam tape over the card front. I stamped and heat embossed the 'Joy' and the rest of the sentiment from In Bloom: Frenchy's Festive Florals with Angelica Suarez. The matching Cutaway was used to cut it out and it was put on foam tape with the rest of the sentiment strip. And of course I had to add some pink and clear sequins from Pretty Pink Posh. I'm sorry this is such a long post but I had so many ideas and wanted to make sure you knew how to put the cards together if you wanted to make them for yourself. Hopefully I've inspired you to try something new! 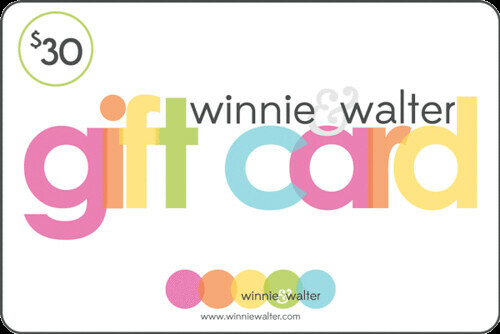 Don't forget to leave a comment on the Leading Lady posts on my blog Twine Around for a chance to win yourself a $30 Gift Card to Winnie and Walter. You might be able to get your hands on some of the new products I used! Thanks so much for the visit and I hope you can pop in next Saturday to see what ideas I have for you! 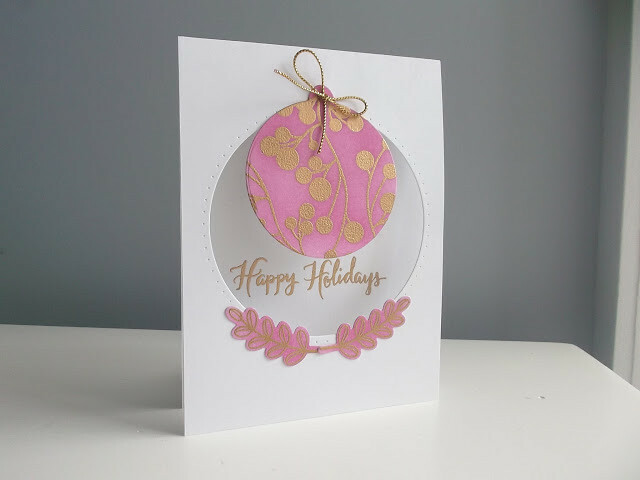 I love the use of pastel here for holiday cards! Just lovely! Wow, Shona, your cards are pretty. I love this plushy pink too. You did a great colours combination. These cards is so elegent and CAS . All beautiful cards! 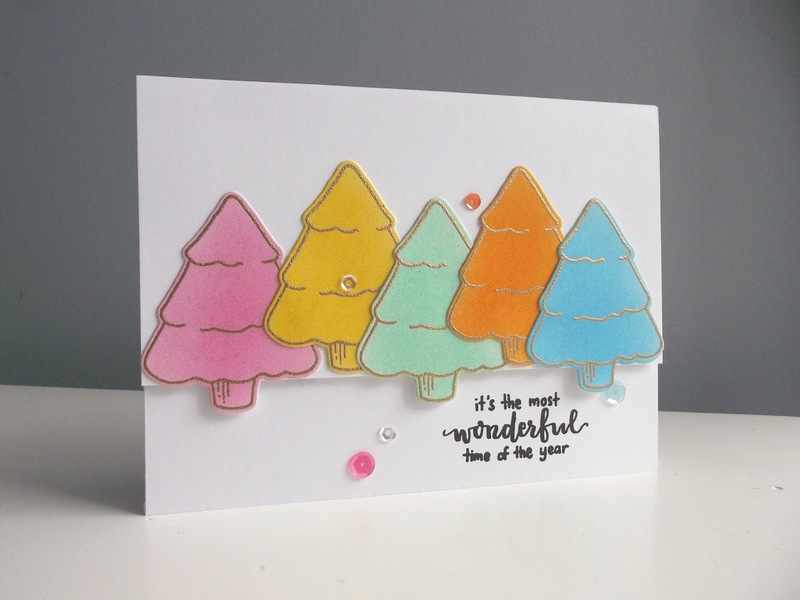 I love the idea of including a useable tree decoration in your card. Gorgeous cards! Love that Merry Berry design that's embossed on the ornament! The wreath card is lovely too! I guess I am becoming a fan of pink on holiday cards! Gorgeous cards, love the metallics especially for holidays. Love the ornament with the embossed Merry Berry and the pretty pink wreath. Oh Shona your cards are delicious today!!! LOve the icing colors, and every bit of the shine!!! OMG! These are all so beautiful & none of them traditional Christmas colors....love them!! Fabulous cards today! Love the non-traditional colors, especially the gorgeous pink! Four beautiful cards Shona! Love the colours! Awesome cards. The wreath card was the best I have seen this year. I love all the colors. Fantastic cards!!! Love the bright colored trees!!! So beautiful! I love the pink wreath! Such great designs and colors! They are adorable and cute, Shona! These cards are beautiful, Shona! 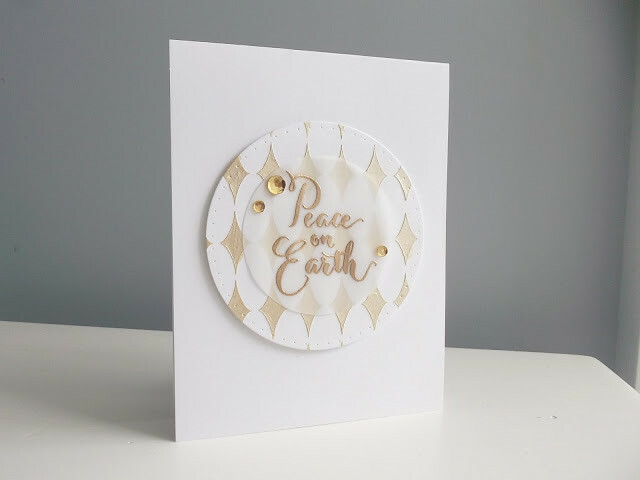 The Peace on Earth card is my favorite because I love that stencil. It looks so classy on your card! Those non-traditional colors give your cards such a modern and elegant look. So beautiful! Gorgeous!!! I am loving the gold and pink colors that you used. I love pink at any time of year, but need to use it more often at Christmas. I adore your ornament card with the peekaboo window to see the sentiment inside and the detachable decoration to use for decor!! Genius! !